On the Menu…Live! » Cocktails for Breakfast? 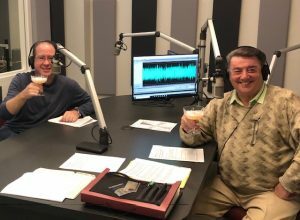 My new “Food-n-Booze” series launched earlier today on KVOI’s A Morning Affair with Mark Bishop, and we talked about the shared spirit of Arizona chefs, brewers, winemakers, sommeliers, and distillers. 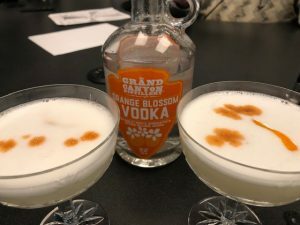 In that context, I shook up a round of OBCs, anchored by the Orange Blossom Vodka from Arizona’s own Grand Canyon Distillery. If the Grand Canyon is the 7th wonder of the world, then the Grand Canyon Distillery must be the 8th! I’ve since had listener requests for the recipe, so here it is, the OBC, courtesy of Tiki Dan and his personal expression of the classic cocktail called the Clover Club! Just make sure not to skip the dry shake at the end. This is what really emulsifies the egg whites to deliver that spectacular crown of foam. And, yes, with these egg whites and citrus notes, this is the perfect breakfast cocktail…for the weekend, of course!